We arrived in Oslo on Friday, January 21st after connecting through Newark on Continental. We landed in Oslo and promptly looked for food before our next flight to Tromso. 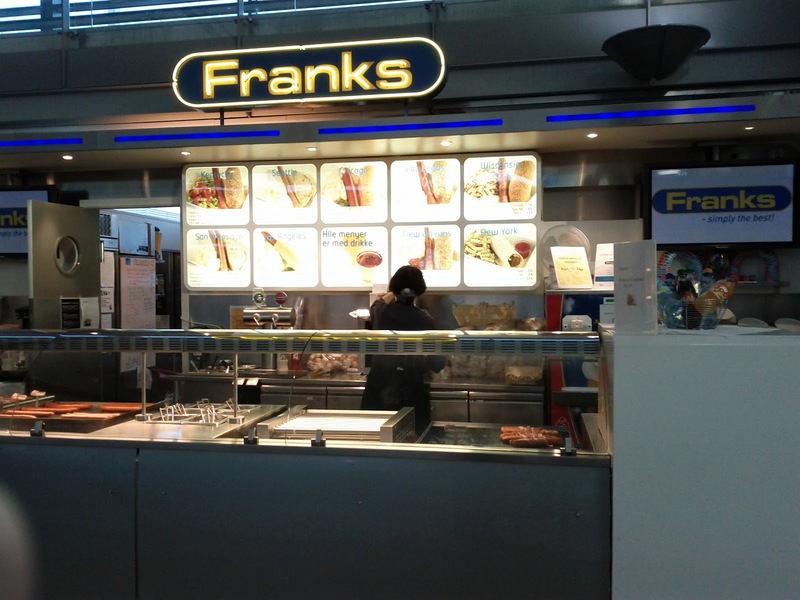 Although we weren't in the mood for hot dogs at 9am - Oslo had both a "New Orleans" and "San Francisco" hot dog at their airport. We landed in Tromso and took the easy Flybussen to the waterfront Rica Ishvahotel. At both the Oslo and Tromso airports, they had the Flybussen shuttle that would take you to the popular tourist hotels for a very reasonable price (around $10/person, much cheaper than a cab). I thought it was a great idea. It ran every 20 minutes and dropped us off in front of our hotel. The weekend we were in Tromso happened to also be the weekend of their International Film Festival. Therefore the city was busy and the restaurants full. Since we were still getting our bearings that night, we walked all around town to find a place to eat and settled on Amundsen's Restaurant. It was a warm and cozy spot with good people watching. While we were eating dinner, it started to snow! Tromso is a city with a rich polar exploration history - apparently it was often the launching point for expeditions to the north pole. Famed explorer Roald Amundsen is a much loved figure by the town and there were several statues in his honor sprinkled around. Roald Amundsen statue in the snow. Tromso was a very charming little town and would be a good launching off place for our arctic adventures. As I mentioned a few weeks ago, my hubby and I just took a mini-vacation to northern Norway. It was a fantastic trip! I have so many photos and stories of adventure to share (which I will do over the next few days). However, I thought I'd start by sharing some of the resources we used to plan the trip. Turns out that we don't know anyone who has ever traveled to Norway or who is from Norway - so planning the trip was an interesting process. Through a Norwegian friend of a Swedish friend of an American friend, we ended up finding a Norwegian travel agent who helped us plan an amazing trip. 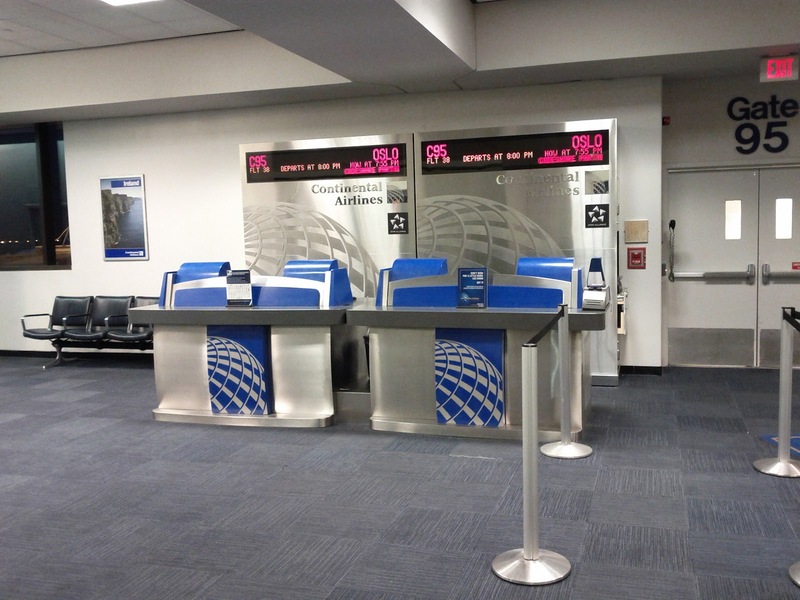 Her name is Christine Gaffney and she owns a travel agency called The Travel Designer. I put together the Google My Map to show you where we were on a map! If you're interested, before we found Christine we had planned a strawman itinerary for ourselves. Looking back, had we done this itinerary we would have missed our favorite part of the trip - Lyngen Lodge! I also think that the Hurtigruten would have been too much of our previous 5 night timeline. We should have considered flying between the two cities (a very short flight). I say this in case anyone who stumbles across this post wants to plan something similar. So would we do anything different next time? Honestly, we would have probably preferred one less night in Tromso for one more night at the Lyngen Lodge. Last, but not least, we rounded up some Norwegian recommendations from our friends of friends. I have put them all in a Google doc in case they might be useful to others. I apologize in advance, I didn't really take the time to format - but I think it is still readable for the most part. Enjoy!! Norway was one of the best places I have ever been in my life. I mentioned that my brother Tommy spent Christmas in Chad. He sent us this photo to show how he celebrated his holiday. I had a wonderful 1.11.11 birthday this year! My husband planned a little party at a local wine bar and invited some friends. You may remember Vino Locale for my favorite summer pastime - mystery flight night on their back patio. He organized a mystery flight night birthday party! It was sooo much fun. He bought me a big cake with lots of frosting. He also bought me an obscenely large ballon. 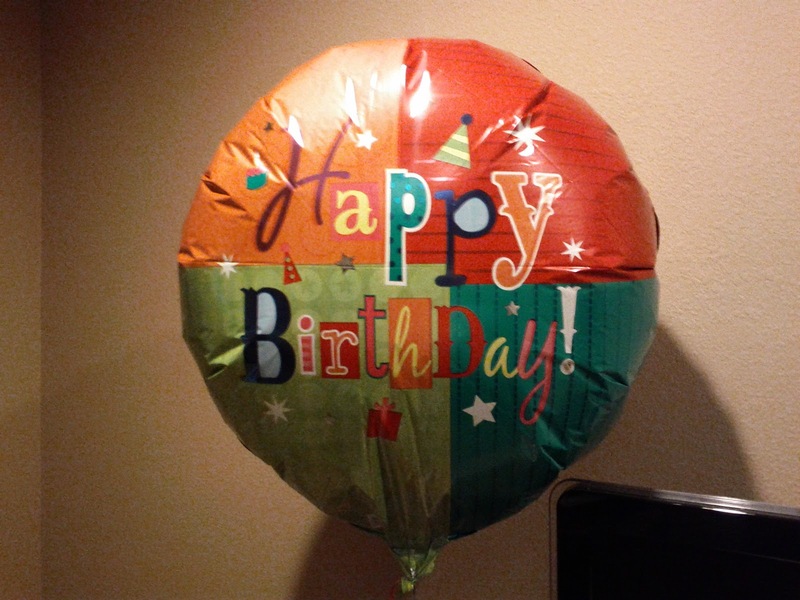 It was fun walking home with it because random people on the street would say happy birthday. 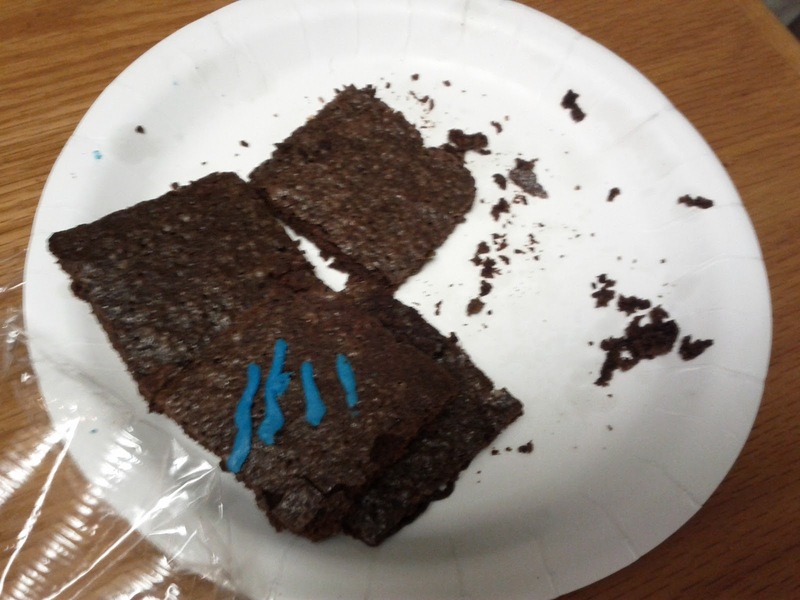 Alison and Eli arrived at the party with a plate full of birthday brownies. By the time we walked in the door at the end of the night, this is what we had left. Can you blame us? The walk home is several blocks... Thank you for my edible treats! Thanks to all of my wonderful friends and family for the amazing birthday wishes and coming out to Vino Locale. 1/11/11 was even better than I could have dreamed! 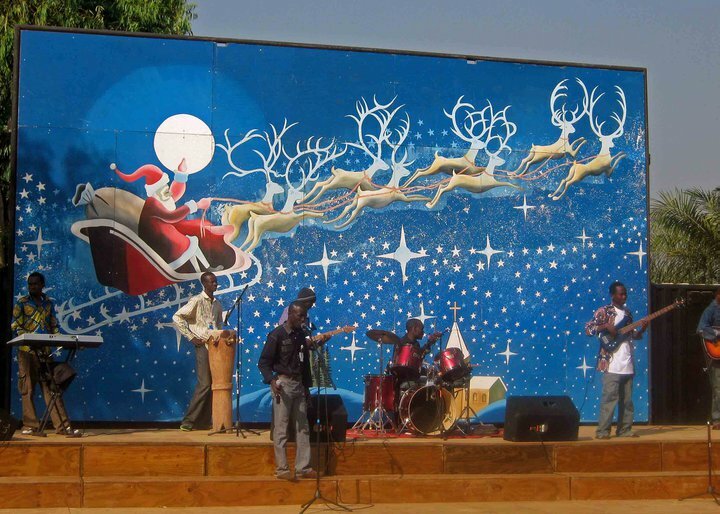 So it is a bit weird to blog about Christmas in January, but I'm behind! Sometime soon I'm actually going to get around to blogging about our halloween party this year too, so don't be surprised. This year we gave the neighbors the same thing we gave our families, friends, and coworkers - the sherry pecans! However, for one special neighbor, we gave the pecans a special treatment. I bought the little green dish at Sur la Table for a few dollars on sale, put the candies in a polka dot plastic treat bag and topped the whole thing with a red bow. I thought it came out really well for under $5. An interesting TED talk from Sheryl Sandberg (COO Facebook). If you're wondering what I've been doing instead of posting on my blog... here are my most recent obsessions (i.e. I spent a lot of time on ebay). We got one of these for Christmas and it became my obsession for 2 straight days. The pieces are all kinds of crazy shapes - actually no two pieces in the puzzle are the same! The puzzle is thicker than most normal puzzles and made out of wood. I then bought myself an early birthday present at Anthropologie - another Liberty Puzzle off the clearance table (and then used a 15% off coupon). They are expensive! Look closely and you can see the odd shaped pieces! 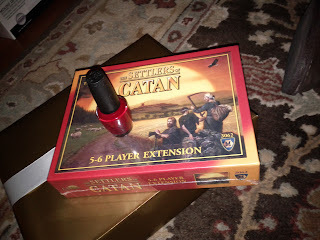 I played this game a lot over the holidays and I got two expansion sets for Christmas - Seafarers and the 5 -6 player expansion set for the original game. Catan and a new nail polish under the tree! Wouldn't this $8,000 one from the 1880's be awesome!? 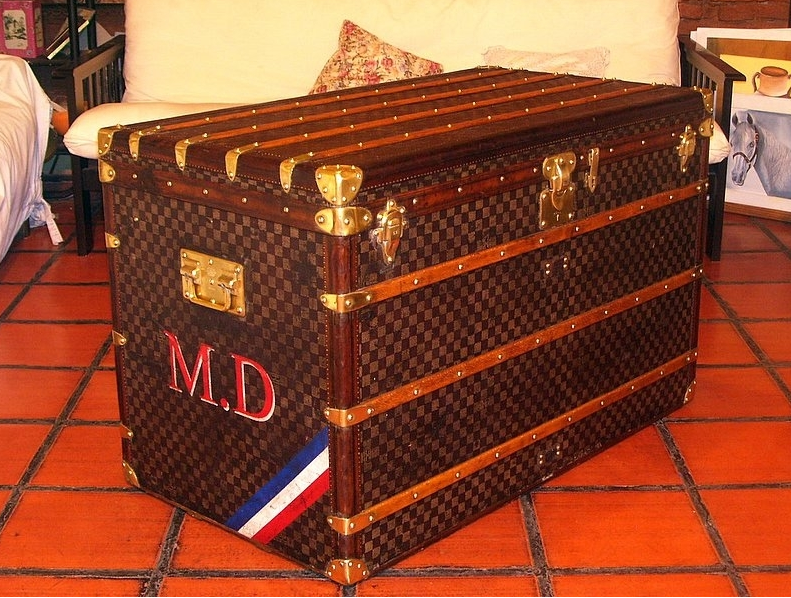 Just search ebay for "louis vuitton steamer trunk" and you'll see lots of cool examples. 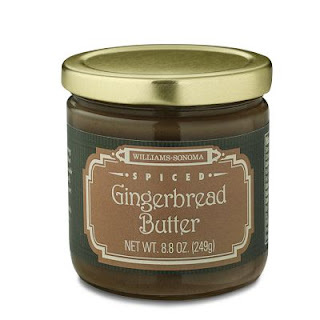 I got a jar of Gingerbread Butter at Williams Sonoma for $1.99 over the weekend. Enough said. I'm going to make baked brie with it! My husband and I just booked a vacation to Norway today! We're off to see the land of the midnight sun - in the winter! You might think we're crazy, but think dogsledding, the arctic circle, northern lights, ice fishing, fire places, a language neither of us speak, and a new cuisine to try (lutefisk anyone?). Try watching this video and NOT going to Norway.